Herringbone Vest: My most recent purchase and I am obsessed. It is warm and cozy and adorable. It was a solid purchase and is perfect to complete my fall outfits. This vest is great because it is a knit weave which is just such a great fall look but not too heavy for the still semi-warm weather. Field Jacket: I bought this last spring and I have been waiting to wear it in the fall because it is just the perfect fall jacket; light for the slightly cool weather and just perfect for the fall color palette. Blanket Scarf: Blanket scarfs are simply perfect. They are the cutest accessory to any fall outfit. As I law student, I spend a large chunk of my day in classrooms and they are often freezing; blanket scarfs keep my neck warm and double as a blanket for the really cold classrooms. Chunky Knit Scarf: Another fall staple- a quality knit scarf is the best accessory for outdoor fall activities and to dress up a simple outfit. Scarfs, blanket or knit, are so necessary for fall outfits. Striped Tee: The perfect got to for fall outfits, Layering is key for fall weather and this can just play into so many different outfits: add a scarf, wear it under a vest, add a statement necklace, wear it under a flannel; the possibilities are endless. Gingham Button Down: I cannot find a link to one on the internet I like but sometimes you just have to keep searching. I found mine at TJ Maxx. This is another basic staple so necessary for fall outfits. It layers perfectly, stands alone or looks perfect under a vest with a statement necklace. Fishermans Sweater: Chunky knits make my heart happy; I love nothing more than a cozy fishermans sweater. Perfect for cool fall days and the perfect layer for over a button down. Flannel: Fall and flannel go hand in hand. The go to for bonfires and football games; a cozy, soft, worn flannel is almost as synonymous with fall as apple cider. Riding Boots:Can one get through fall without riding boots? 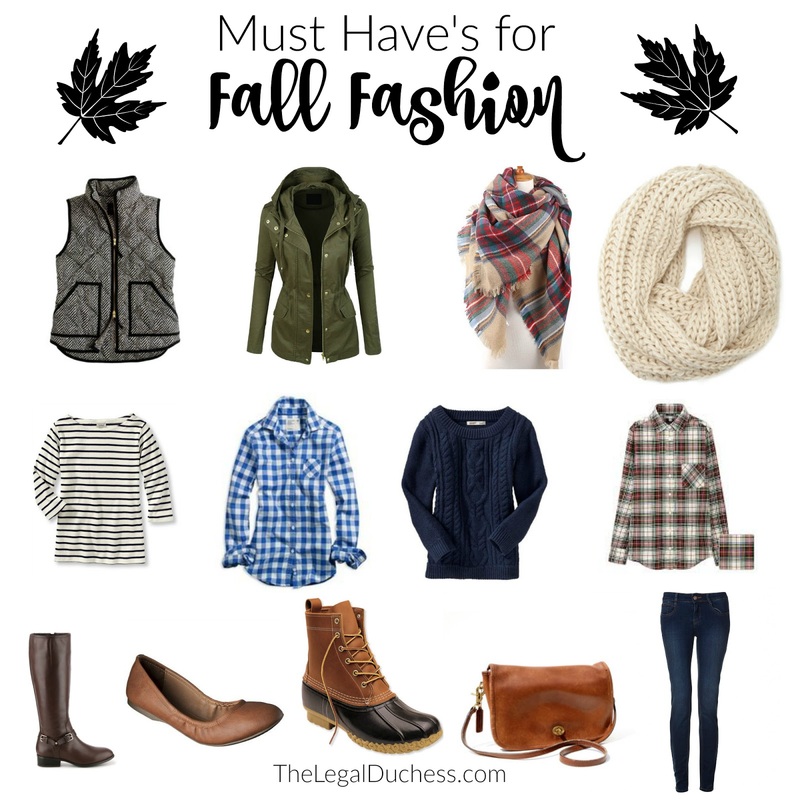 I wear mine nearly every day of fall with skinny jeans and one of my various fall top options. They are just fall-tastic. Leather Flats: When the days are a little warmer and I don't need my toes covered, i love a simple leather flat in a soft brown or cognac shade to round out any outfit. Bean Boots: My. favorite. shoes. ever. My dad grew up in Maine so I feel like Bean boots are just a part of my heritage. The perfect activity shoe for fall, they keep your feet warm and dry. As much as I love my riding boots and leather flats, but Bean boots just have an essence of fall that demands to be worn at least once a week. Leather Crossbody: Come fall, I feel I should put away the bright bags and transition into something more muted. I am not ready to pull out the blacks so a simple, cognac leather crossbody fits the bill for a perfect fall bag. I prefer a crossbody so that while I am out and about enjoying the gorgeous fall weather I have my hands free. Skinny Jeans: Every single day. This is what I wear every single day. Invest in quality pairs that will last and hold up to everyday wear. Skinny jeans in a nice dark wash go with everything and are absolutly necessary all year long. The quality is top notch! I was so impressed when I unwrapped it. I think the knit weave is so much classier and in season than the nylon counterparts. Yes! These are on my fall wardrobe shopping list! Happy shopping :) There are some GREAT deals floating around right now! Such great picks! Vests are my ultimate go-to for Fall, perfect for days when you need that added warmth on top of an outfit! I can't believe I waited this long to invest (haha get it??) in a good Fall vest. Such a game changer! Blanket scarves are the things I absolutely love most in the world! I think I own four or five now, haha! Great picks! Love your blog, too! Same. Blanket scarves are the best thing ever. I can't seem to stop buying them whenever I find a good plaid.... I just have to have it!